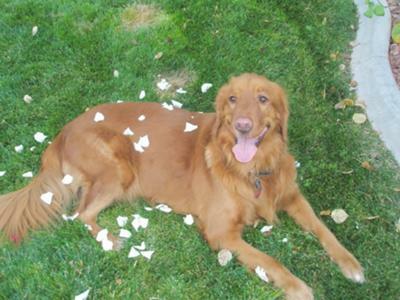 This is a story about our beloved golden retriever who passed away suddenly this February from a ruptured tumor on her spleen. Maggie was not only a dog, she was a big part of our family. She was my best friend and loyal companion and the best gift ever given to me. Maggie was only 8 when she passed, and to say the least, we were not prepared at all. Maggie was a gift to my daughter Raquel for her 19th birthday. When Raquel decided to go to law school in San Diego, she and Maggie packed up and left. Finding out that her days were spent at school, Raquel made the hard decision to have Maggie come home to stay with us, seeing that we were home a lot and had another dog, Daisy, for her to play with. Maggie became my dog, and that's when we became inseparable. Maggs traveled with us all over. She went down to San Diego frequently with us and went sailing, hiking, to the dog beach, and there wasn't an outdoor cafe we didn't visit without Maggie laying under the table at peace.. To say the least, she was the joy of my life. Maggie was in tune to everything that went on. We had my mother-in-law living with us. One morning she alerted my husband, who was asleep upstairs in our bedroom, that his mother had fallen out of bed. She kept hitting the bedroom door with her nose until he opened it and then heard his mother yelling for help. Maggie was our Hero. Without any warning one Saturday morning, she didn't want to eat breakfast. Thinking this was odd, I thought maybe she had an upset stomach. When she didn't want to eat her lunch, it really concerned me, so off we went to the vet. By the time we got there, she was visually very tired. When the vet looked at her gums, they were gray. This didn't look good and off she went for xrays. Thinking that maybe she was anemic and needing some meds, I had my daughter Raquel on the phone when the vet came in to tell us that Maggie was dying. I don't need to say what our choices were at this time. She was bleeding out into her stomach and there was only one option. Totally in shock we had to make the decision, and had little time to say goodbye. It has been only a few months and we are still mourning this precious gift. Maggie is at rest, but she has left behind so many memories of her being—the swimming pool out back that she loved to play in, to the quietness of her not being here. We thought that we would have at least 4 more years with her, but God works in mysterious ways. There is a reason Maggie was taken from us too soon and I am still trying to figure this out. But one thing I do know is that this Dog has taught me so many lessons in life and has shown me what loyalty and unconditional love and trust are. We were truly blessed to be her family. Maggie, you are gone out of our lives, but will never be gone from our hearts.